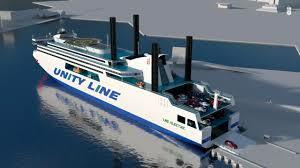 NED-Project company is working on a project to design a new LNG electric ferry for the Baltic Sea for the Unity Line, a subsidiary of Polska Żegluga Morska (PZM). The new 204m 9000 dwt Unity 1 class will be based on the Ystad Max class and be powered by four Wartsila W6L50DF engines and four wind generators. When completed, it will sail on the historic route from Swinoujscie in Poland to Trelleborg in Sweden. “The new passenger and car ferries for Unity Line, developed jointly with PŻM and Wartsila, is a very innovative response to current market needs and environmental requirements,” said Zbigniew Szyc, CEO of NED-Project. The new ferry will have LNG propulsion (more accurately – a dual fuel with LNG as the primary fuel) and also a hybrid one. It will also be equipped with four vertical wind generators which would charge the ships’ batteries during berthing. The generators can also work during a crossing and not affect the speed of the ship. NED-Project said that the cooperation with PŻM will make it more of an expert in the area of designing passenger car ferries. The decision on the construction of ferries and on the sources of investment financing is expected in June/July. The new ferry, one of four if the project is approved, is part of PZM’s future investment plans to increase its gross tonnage through cargo fleet expansion along with building new ships. 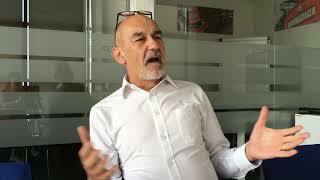 It is also looking to establish a connection to southern England in the future. Other projects it has in the pipeline are an LNG fuelled tanker PSV conversion to be powered by Wartsila and 15 innovative lake freighters weighing in at 36 500 dwt each to be built between 2020 and 2025. The hope is that at least some of these projects will be built in Polish shipyards.